Last Exit Live: IT’S ALIVE!!! Just when you think things couldn’t get better for the Arizona music scene you turn the corner and something new pops right up at you. In this case it’s a bit of history coming back on many levels. The popular Tempe music venue Last Exit, which was open from 2003-2009, is reopening courtesy of its original owner Brannon Kleinlein in a new downtown Phoenix location. The former Tempe location featured the best in local acts along with many national touring acts such as Zac Brown Band, Gin Blossoms, Candlebox, Dramarama, The Format, Roger Clyne & The Peacemakers, Cross Canadian Ragweed, Authority Zero and more. The new venue is Last Exit Live and it’s located in downtown Phoenix in the building that once housed the former venue Ruby Room. 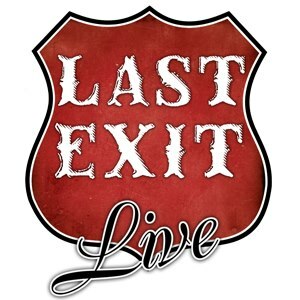 Last Exit Live is a 21 and over venue that features high quality production with a new stage, sound system, lighting, and band load in entrance, in an intimate small venue setting. Tomorrow night, Thursday, March 20th, Last Exit Live will open its doors for the first time. It is assuredly promised to begin with a bang! Certainly the founder of the Apache Lake Music Festival will see to that, as he has already scheduled Hunter Johnson, Greyhound Soul and Sara Robinson & The Midnight Special to be there. There is little doubt that Last Exit Live will make an enormous impression with the local music scene and provide yet another spectacular venue in which established and up and coming performers can impress both fans and newcomers alike. Last Exit Live is located at 717 S. Central Avenue just south of Grant Street and 1 block from the neighboring bar The Deuce. Be sure to check out soundsaroundtown.net for all that is going down with Last Exit Live and the showcases being held at this exciting new/old/wonderfully familiar venue! You should probably plan on getting used to loving and living at Last Exit Live this weekend when they hold some serious after parties for McDowell Mountain Music Festival–Friday Night featuring Dry River Yacht Club and Saturday Night with Banana Gun. They will also be the ones sponsoring the amazing local stage at the festival which will feature Yellow Minute, Ladylike, KONGOS, Sara Robinson, The Wiley One, Fayuca, Cousins of the Wize, Jared & The Mill and Future Loves Past. April 5th KONGOS and Mergence will take the stage at Last Exit Live. Talk about some hard hitters for this exciting time! Last Exit Live has a lotta attitude without much reason for it. If Last Exit Live were so much better than other clubs, they’d treat the bands better than other clubs. Instead, you don’t get the sound check you arrived early for and they won’t even give the bands a couple of drinks to show good will. Other clubs happily give bands a little something as a way to say thanks for bringing in people and helping make the bar a success. For being in a terrible neighborhood that no one would want to visit, Last Exit Live can’t take the bands for granted. Unless their current attitude changes, I’m sure they won’t be around long.